scrape the surface in terms of what Linux really is. Linux distributions and the purpose of those distributions. installing the Linux distributions that I review. really shows you the inner workings of Linux. For those of you that bought the original version of “How Linux Works” it is worth knowing that the second edition has been completely revised and expanded with new content. philosophy of why Linux works the way it does. level there is the physical hardware such as your hard drive and RAM. Everyday Linux User focuses on). also covers the Linux folder structure. much further than their own home folder. the folders you need to back up. and provides details of udev. install and configure Grub as well as information about UEFI. utilisation, system configuration and shell scripting. technologies such as Wayland and MIR. subject and helps to join up some of the dots. 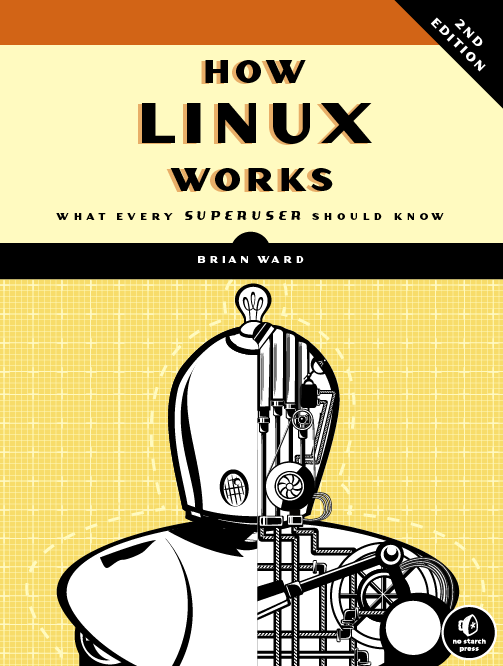 “How Linux Works” is available from Amazon, nostarch.com and all major booksellers. Thank you very much for the book recommendation. I got a copy next day through Google Play. It was actually cheaper than Amazon. I'm looking forward to reading the chapter on partitioning. The information I have found so far online about partitioning a hard drive for Linux often omits important information, skips steps, is incomplete or is contradictory and written for an audience that is familiar with Linux at an intermediate or advanced level. Anyone somehat experienced with Windows knows that it's a good idea to keep the user data on a separate partition from the OS itself. In Linux, there are additional options to keep various parts of the OS on separate partitions, although not necessary for a beginner / average user. However, keeping the user data on a separate partition is still a good idea. This would allow users to install and try out different distributions without having to backup / move the user data files to an external drive and then copy / move them back to the new home directory each time. It would obviously also allow users to have several distributions installed at the same time and share the same user data. Please note that I'm not saying that backing up data is unnecessary. It should always be done before installing a new OS of any kind, just in case.